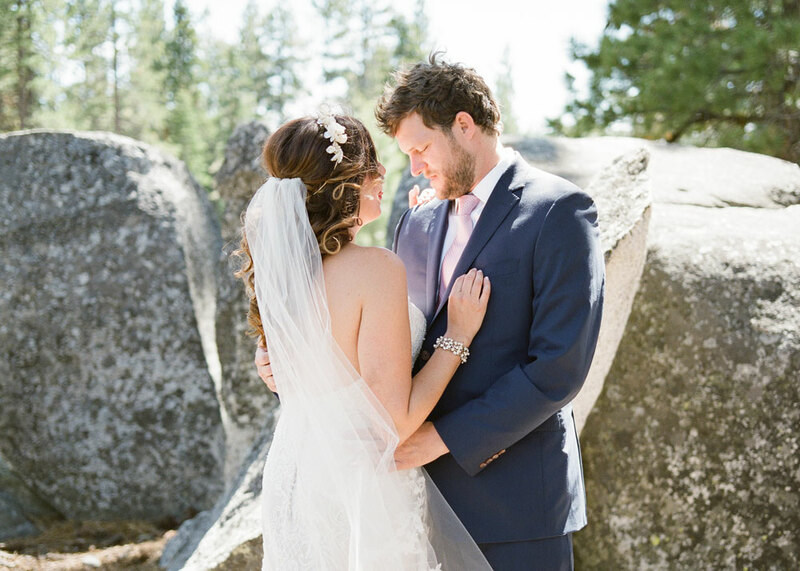 When Brittany and Lincoln decided to say their vows on the shores of Lake Tahoe and asked us to create a destination experience for their closest family and friends, we felt our hearts take flight. We packed our bags and hopped on a flight out West to scout venues and find the perfect location for them. It took a lot of trust for them to rely on us to plan this wedding from afar – especially since our team never met them in person until the week of the wedding – but that trust was something that enabled us to do our jobs well. On the wedding day the sun set brilliantly behind the mountains, the breeze blew through the silk ribbons on her bouquet, and Brittany and Lincoln danced on cloud nine until the wee hours. What to do when you love cheese but don’t love cake? Two words: cheese cake. Très chic! Loved seeing Lincoln showing off his new wedding ring.We’re all used to oohing and ahhing over beautiful diamond rings on our bride’s fingers, but his joy was so infectious and endearing! The team at Rebecca Rose Events is the most comprehensively capable wedding planning and design team I have ever worked with.